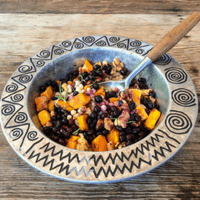 Recipe Lauren O’Connor of Nutri Savvy Health. In baking dish, coat squash with 2 tsp of olive oil and toss in garlic. Be sure to coat well. Toss in Sprig of Rosemary. Bake in oven for 20-25 minutes, until garlic is lightly toasted and butternut squash is softened. Lightly pan-fry cooked couscous with 1 tsp oil for 5 minutes; set aside. Toss butternut squash, couscous and walnuts in a serving bowl, reserve 1/4 of couscous. Gently fold in drained wild blueberries. Toss in remaining couscous to add brightness (blueberries add in a colorful purple stain).